Anne Frank was a girl from a Jewish/German family. They lived first in Germany but when the Nazis got the power, they left to the Netherlands. In 1940, The Nazis invaded the Netherlands and the Jews got many restrictions such as wearing a yellow star. When the family received a call-up in 1942, they decided to hide themselves. Anne started to write in her diary about her daily life in the secret hiding place. August 1944, the family was betrayed and they were transported first to Westerbork but afterwards to Auschwitz-Birkenau and Bergen-Belsen. Anne got typhus and died in 1945, a few weeks before the camp was liberated by the British Army. 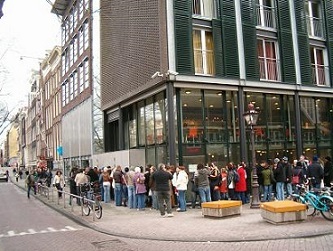 The Anne Frank House is less than 10 minutes walk from Damsquare. Walk between the Royal Palace and the New Church. Turn left and walk around shopping mall ‘Magna Plaza’ into the Raadhuisstraat. Cross three canals and then you will see the church ‘Westerkerk’ on your righthand. The Anne Frank House is just behind the church. From Central Station: take tram 13, 14 and 17 and get off at bus stop ‘Westermarkt’. It’s about 20 minutes walking from Central Station to the Anne Frank House.